Northern Ireland midfielder Chris Brunt will now learn on Wednesday the extent of a knee injury amid fears it may rule him out of Euro 2016. Brunt, 31, was carried off during West Brom's Premier League win over Crystal Palace on Saturday and there are concerns the damage could be serious. The Northern Ireland man has been expected to see a specialist on Tuesday but this will now happen on Wednesday. Brunt missed the 2-2 draw with Premier League leaders Leicester on Tuesday. 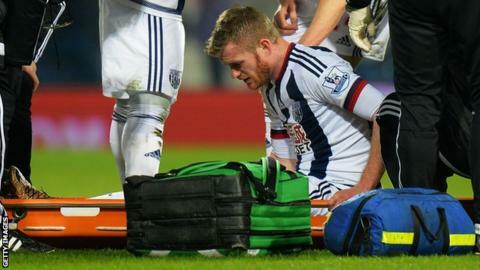 "Brunty is going to see a specialist so we will wait until he has done that," said Baggies boss Tony Pulis on Monday. "So we will wait until he's done that, then announce what is wrong with him." He added: "I have only seen it from a distance." The midfielder's injury came days after he was struck in the face by a coin thrown by an Albion fan at the end of the FA Cup fifth-round defeat at Reading. Northern Ireland have been drawn in Group C for Euro 2016 in France, alongside Ukraine, Poland and world champions Germany. Their first match is against Poland in Nice on Sunday, 12 June.